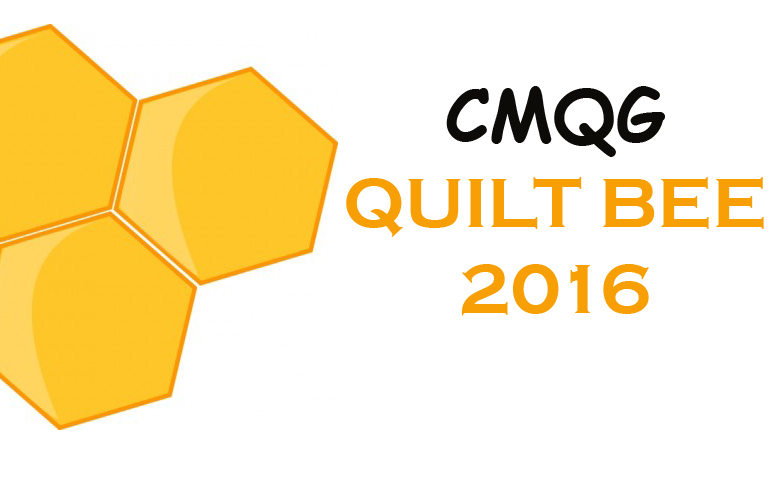 2016 Board: Ellen M. officially nominated the following to the CMQG board. 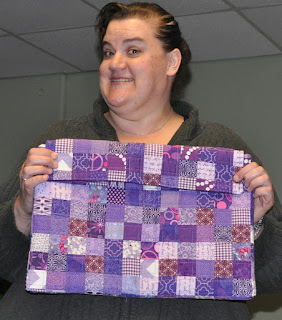 All were seconded and unanimously voted into office. 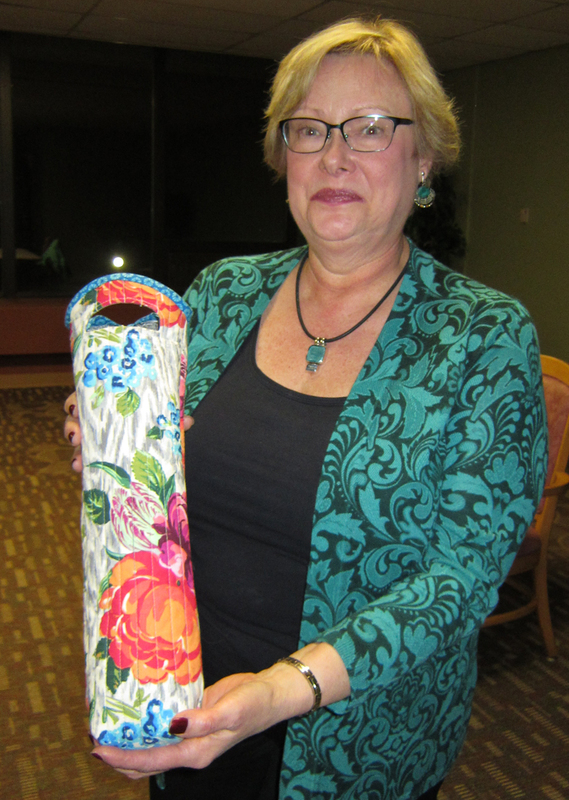 The board will start its term in January 2016. 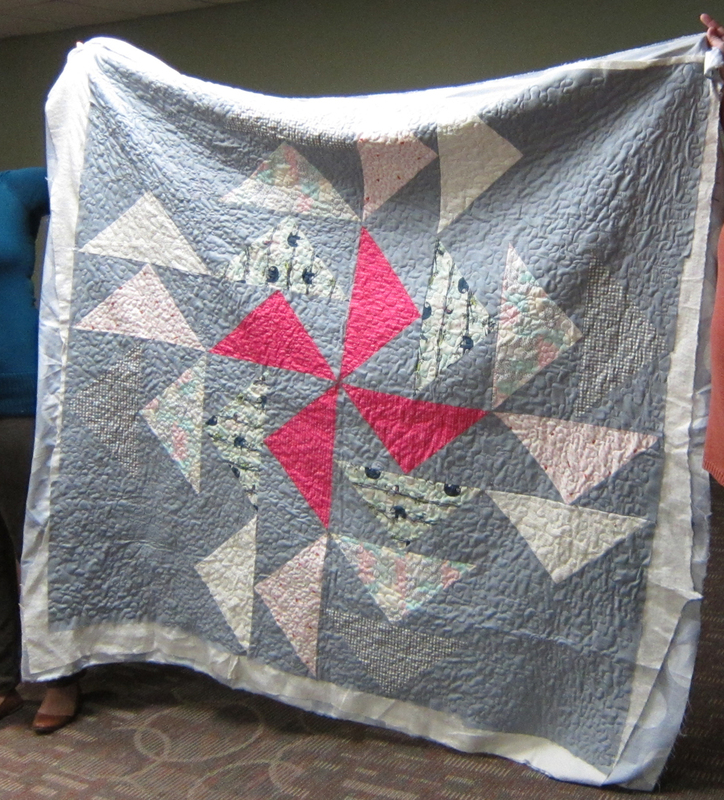 Congratulations—and thank you for your service! 2016 Committee Chairs: Annie has agreed to be the Swap Committee Chair. 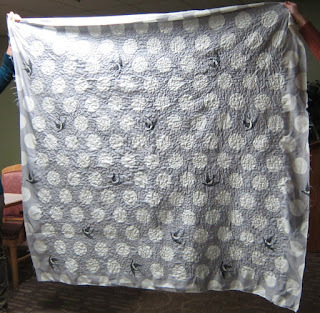 We are still looking for people to co-chair the Charity Committee with Ellen M. and the Education Committee with Brooke (or to act as sole chair for either committee). 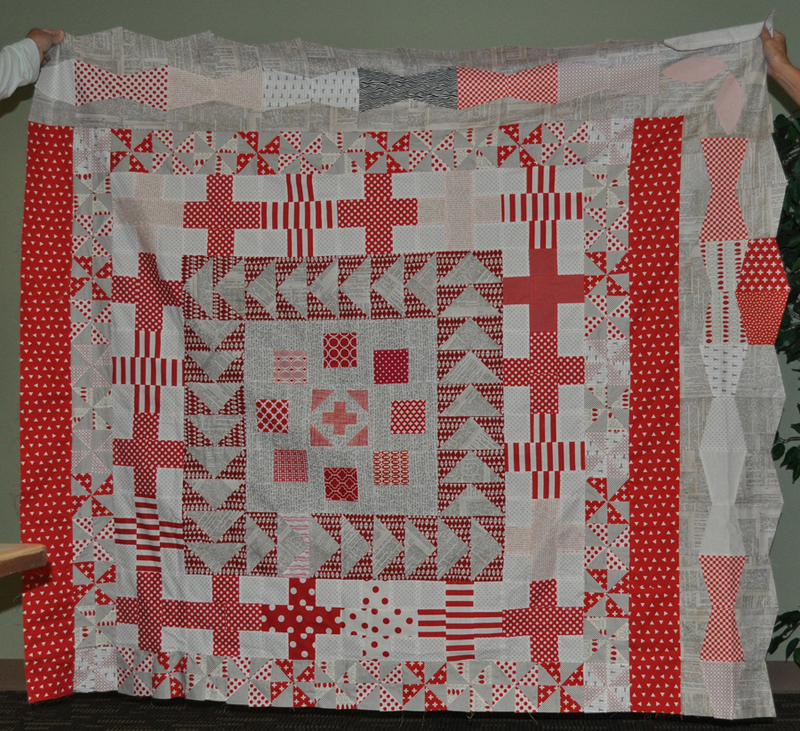 Please see Ellen B. or Janine if you're interested. 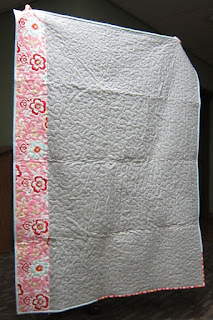 Abby made this memory quilt using a piece of an old wedding dress as well as other fabrics. 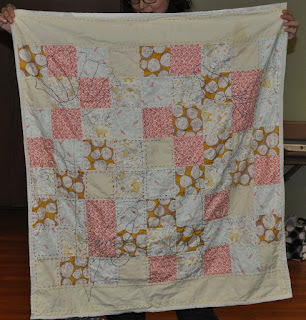 Annie did the quilting. 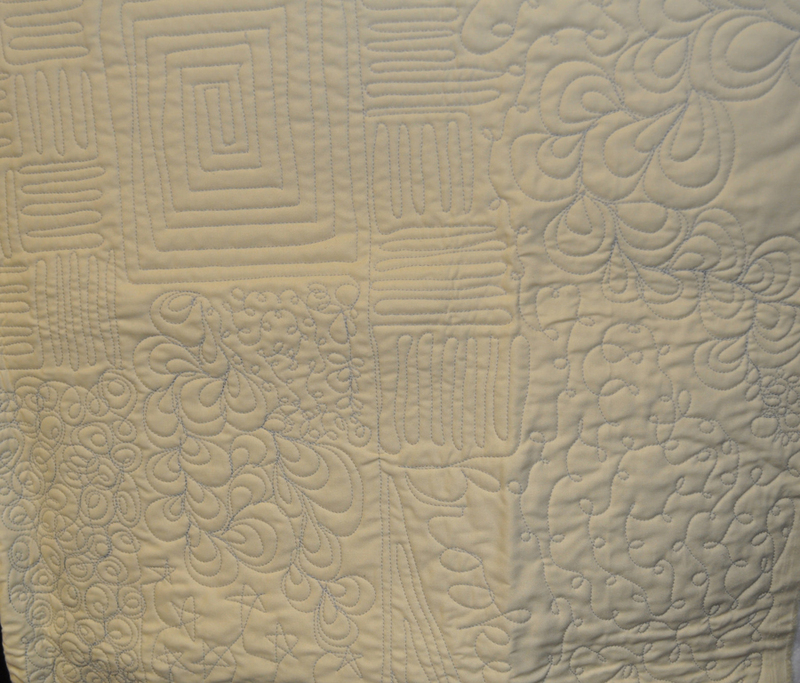 The back of the memory quilt is sateen. 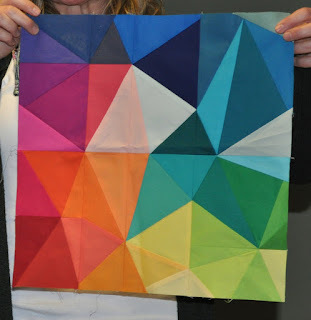 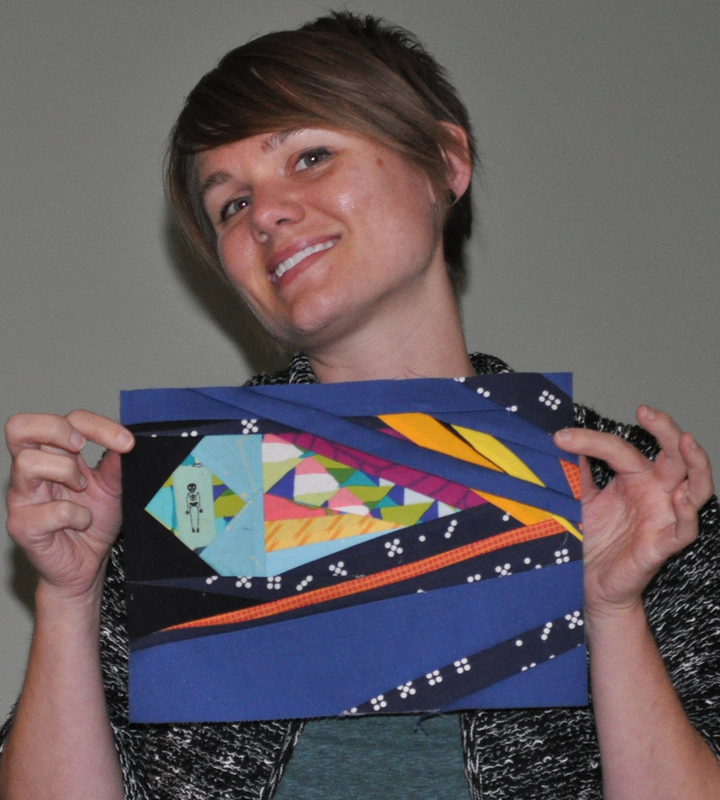 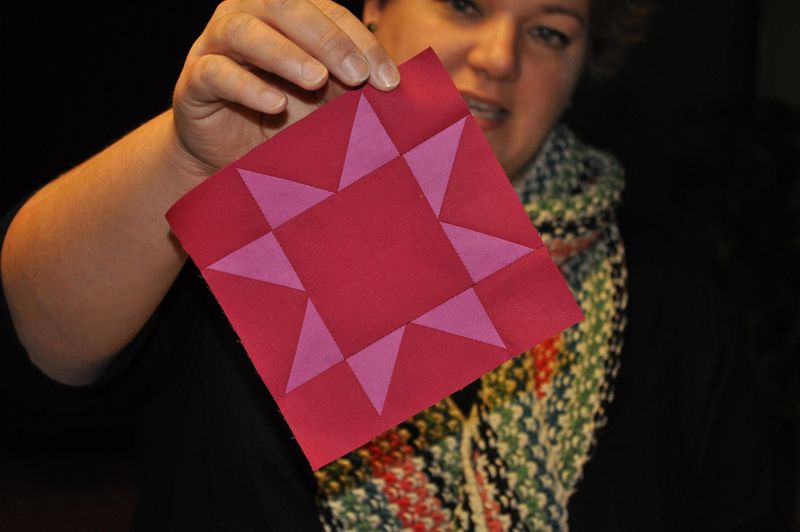 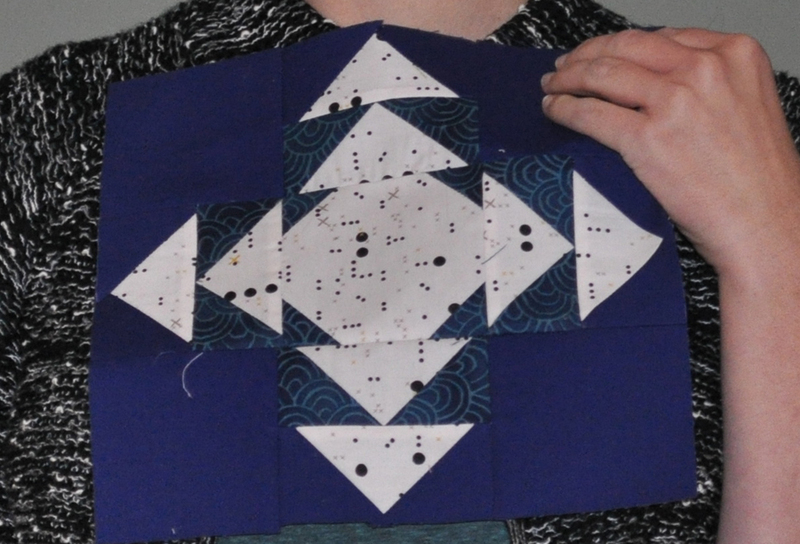 Brooke created a paper-piecing pattern for this star block. 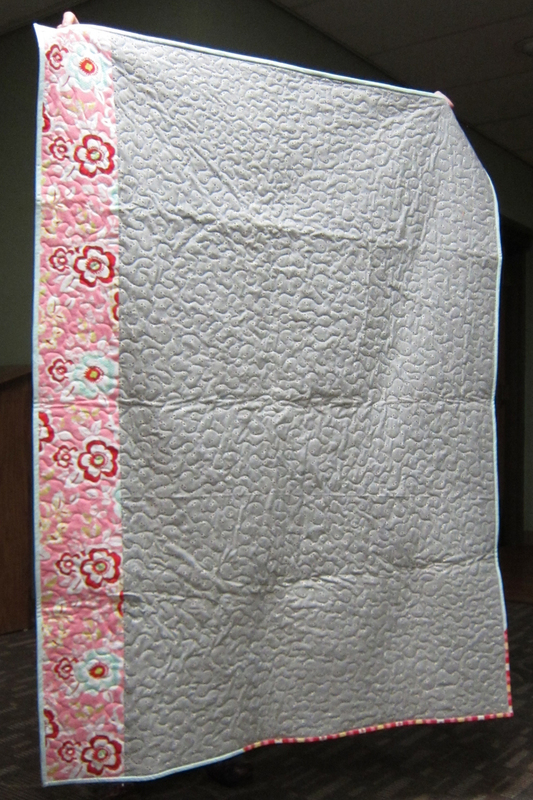 Amy finished this quilt, which is a wedding gift. 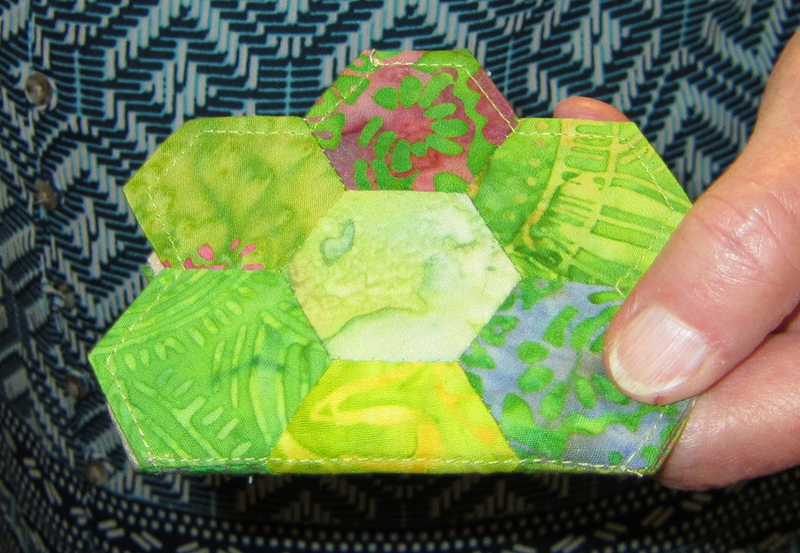 Carrie's sister made this hexie needle holder. 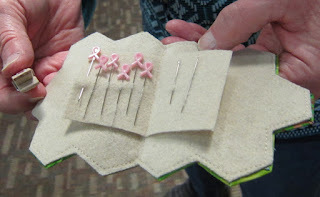 The inside of the needle holder. 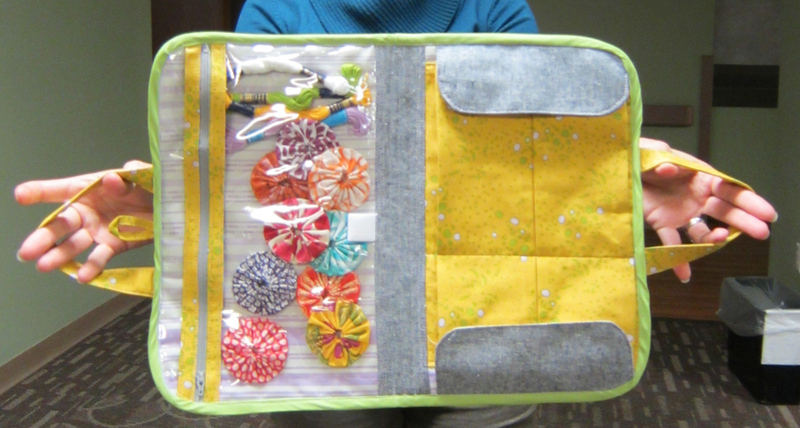 Carrie made a Sew Together Bag. 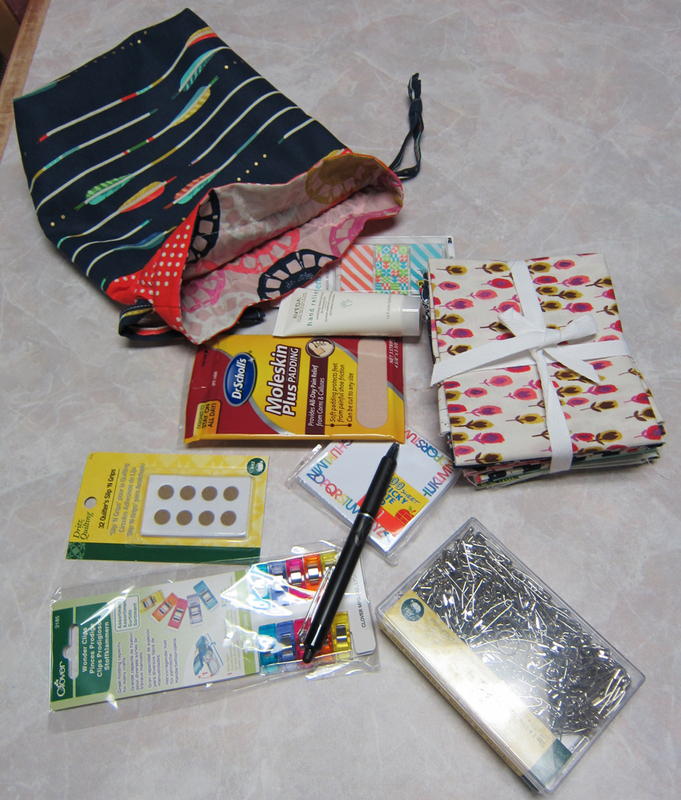 The inside of Carrie's bag. 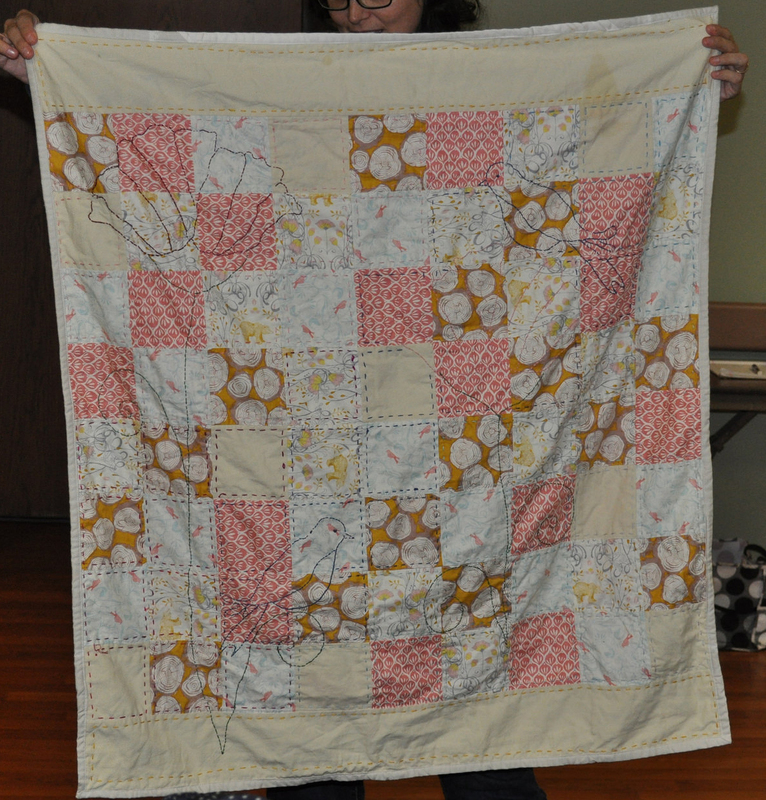 Ellen made this quilt top in record time for a departing co-worker. 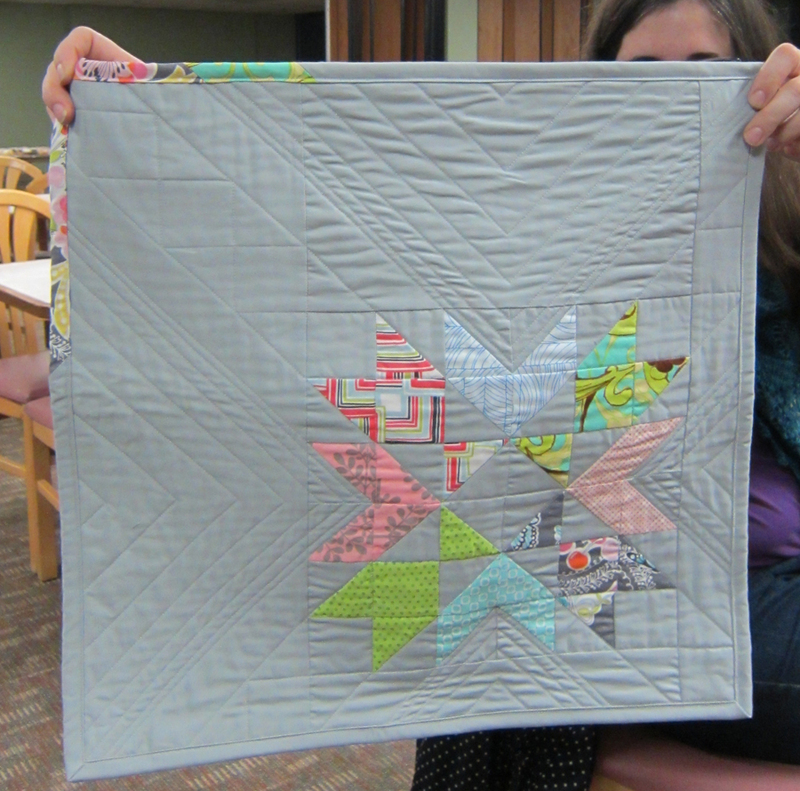 Gillian made this baby charm quilt. 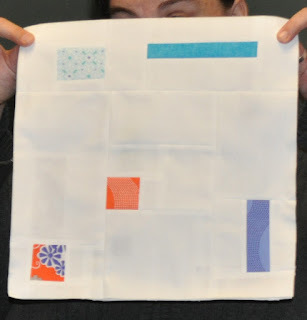 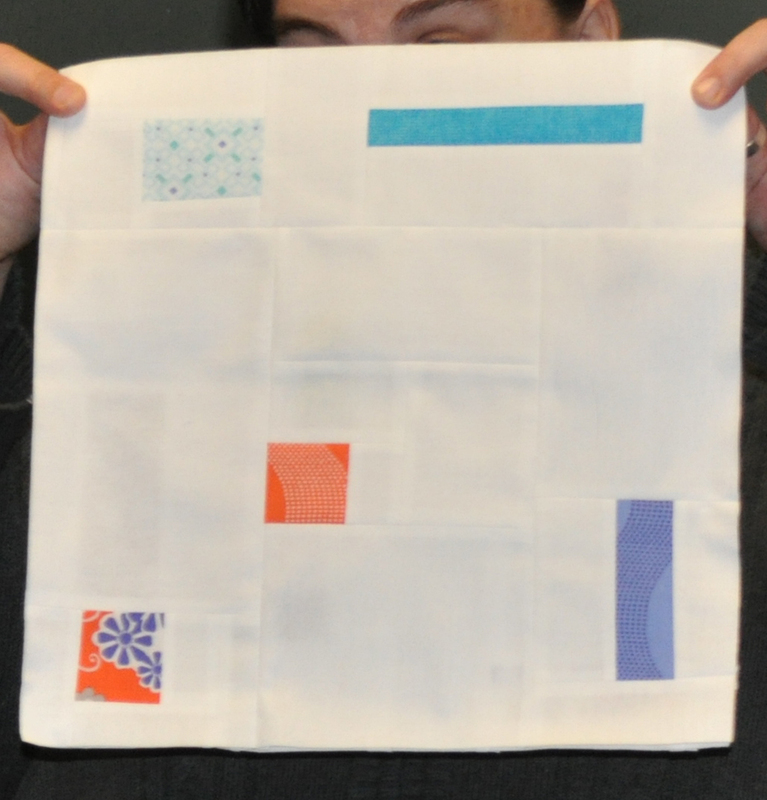 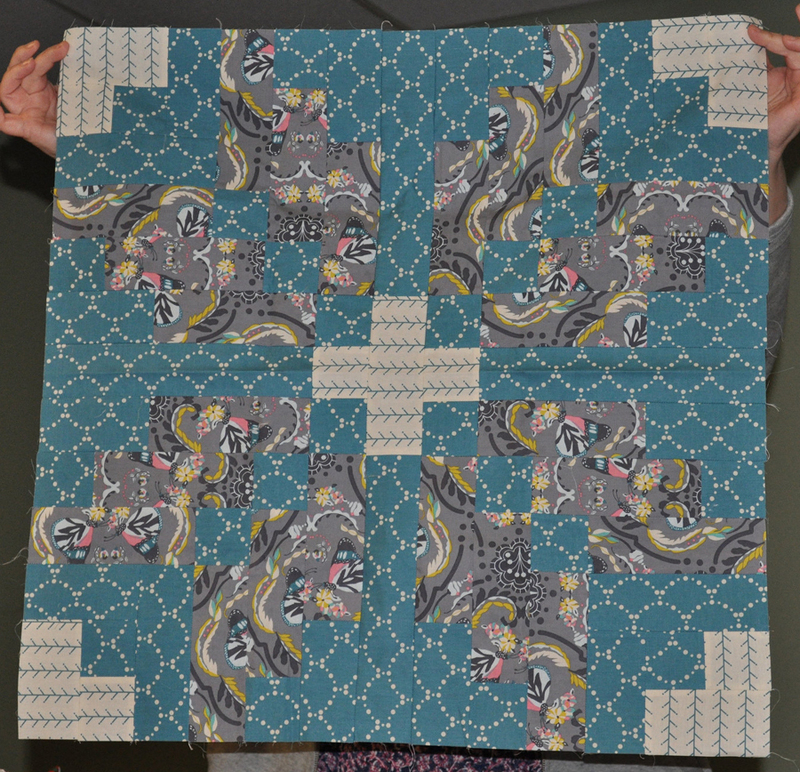 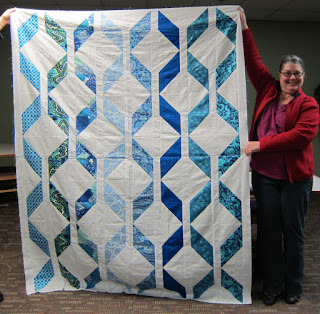 Gillian enlarged the letter block patterns to fit the length of this gift quilt. 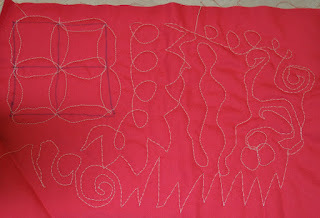 The back of Gillian's quilt. 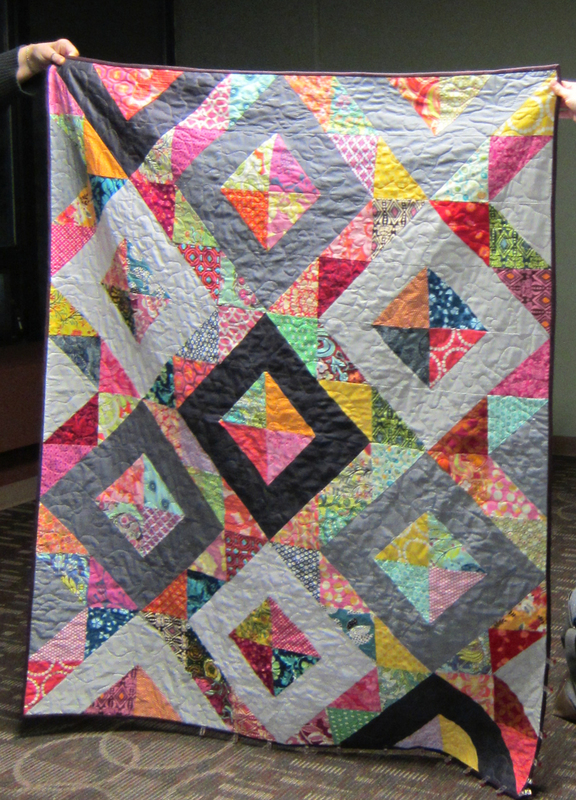 Gillian also completed this quilt top. Kay made this wine carrier after being inspired by one of Abby's Instagram posts. 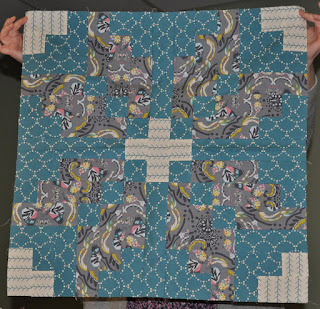 Interested members received the name of a fellow member at the November meeting and brought a handmade gift for that person to the December meeting. Abby made this table runner for Wendy using Cotton & Steel fabrics. The back of Abby's table runner. 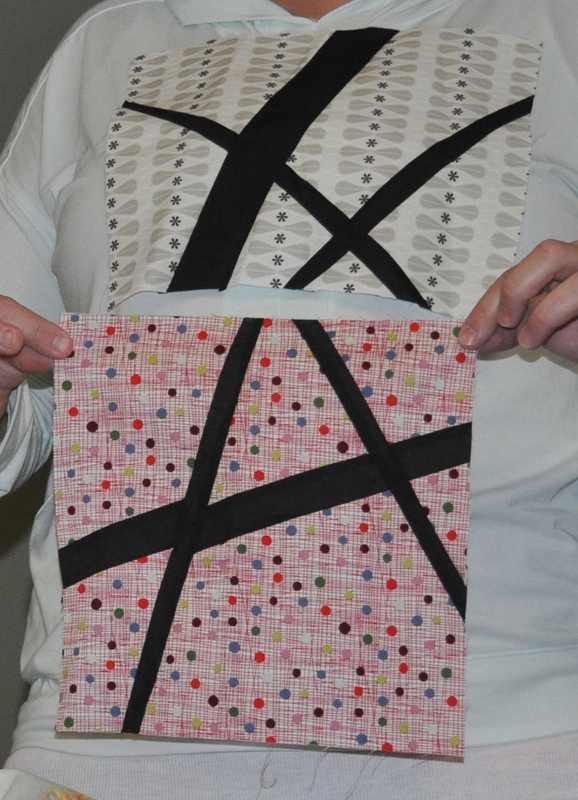 Amy made this Maker's Tote by Noodlehead Patterns for Abby. Brooke made this pillow for Amy. 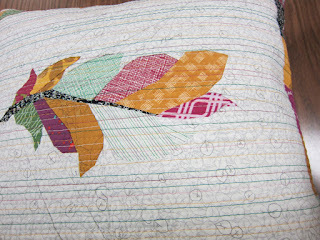 A detail shot of Brooke's work. 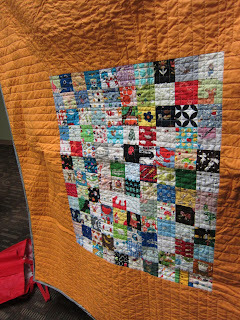 Ellen B. made this mini quilt for Holly. 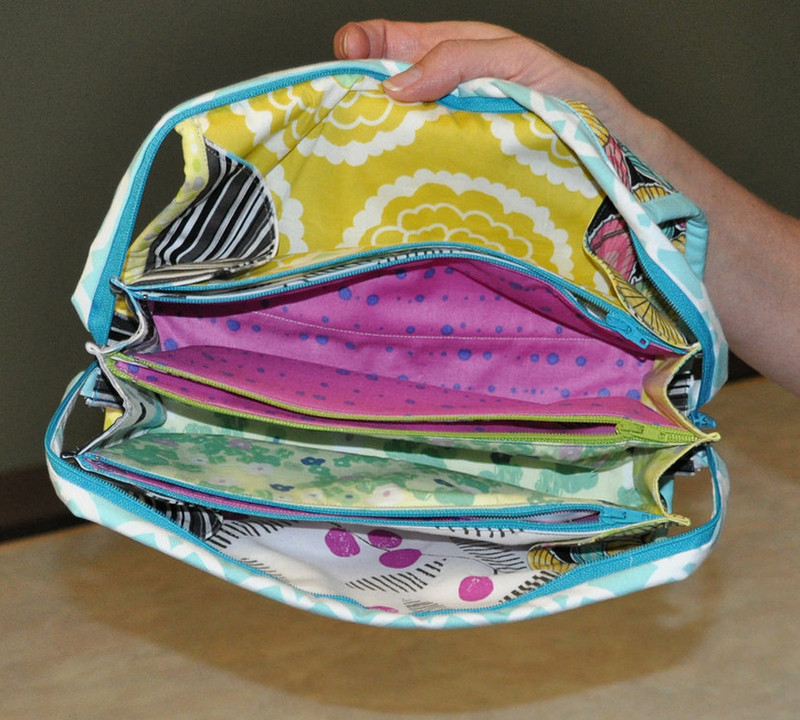 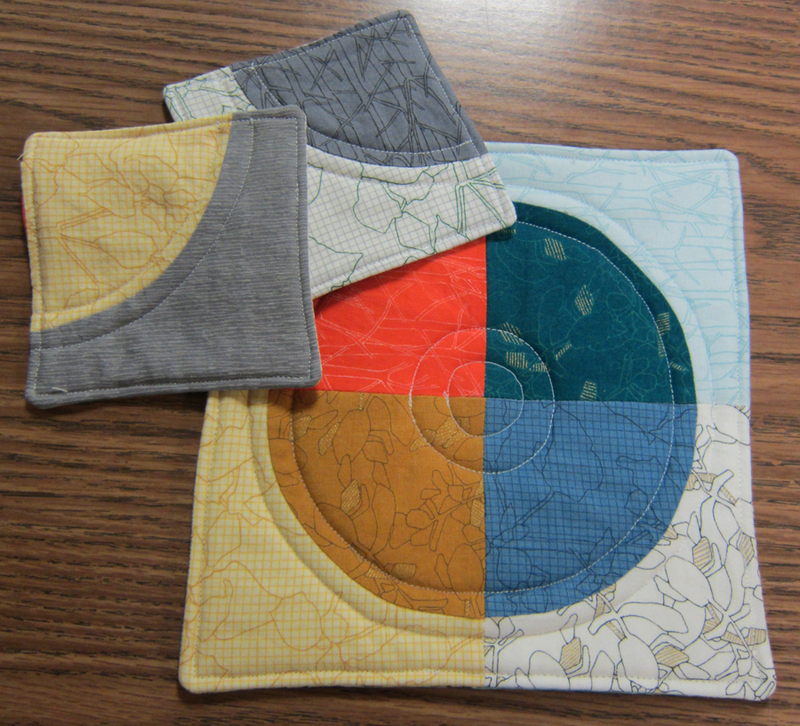 Ellen M. made the pouch and selected some notions and fabric for Shonna. Gillian made these double-sided coasters and hot pad for Ellen M.
The other side of the coasters and hot pad. 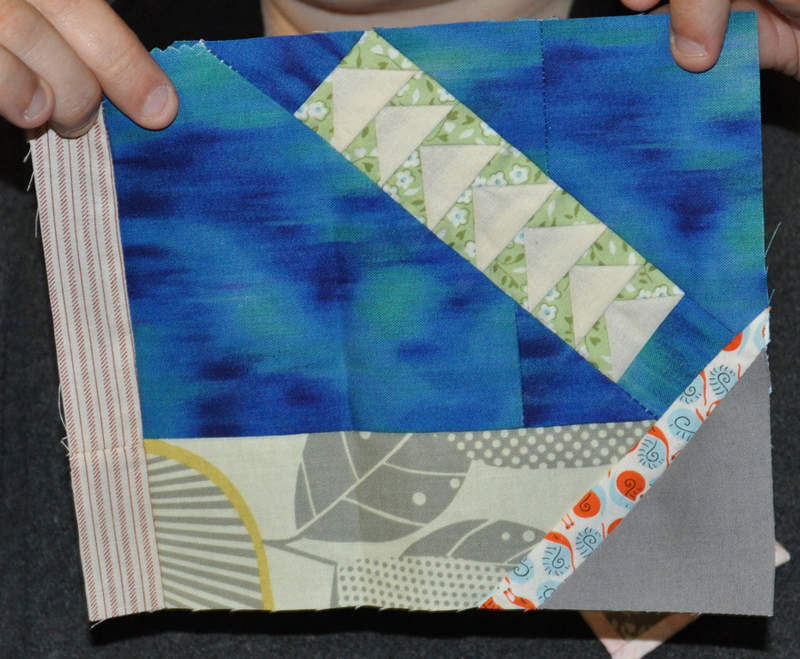 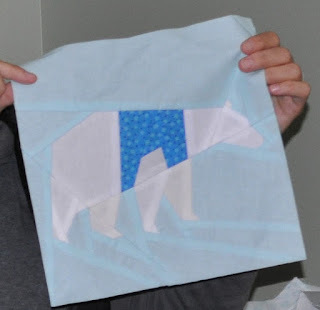 Holly made this mini quilt for Gillian using a free Denyse Schmidt pattern. 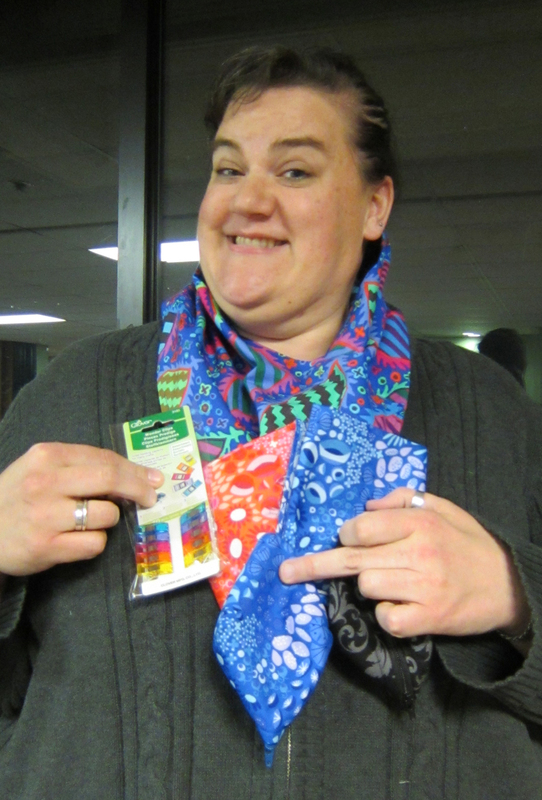 Pat made this scarf for Brooke and included some notions and fabric. 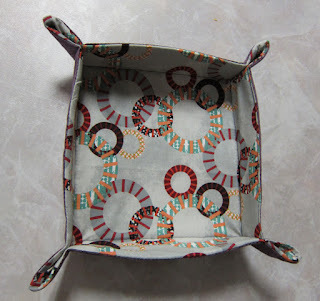 Shonna made this box for Pat. 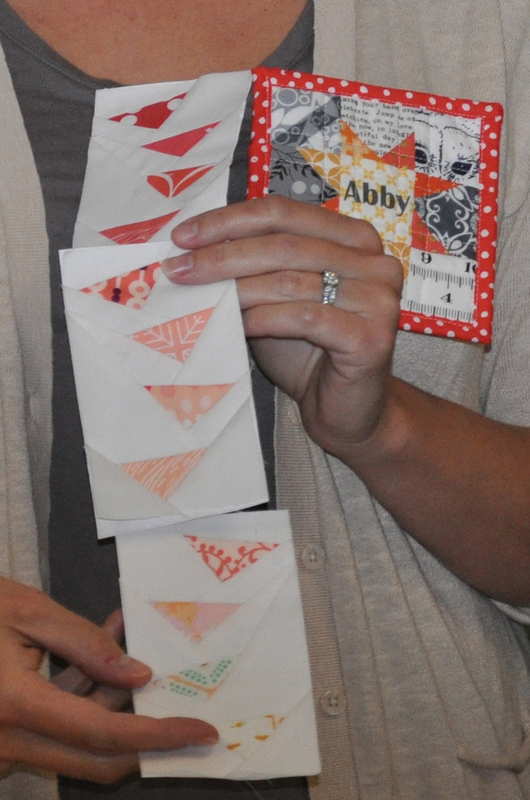 Thank you, all, for your service! We are still looking for chairpersons for the Education and Charity committees. 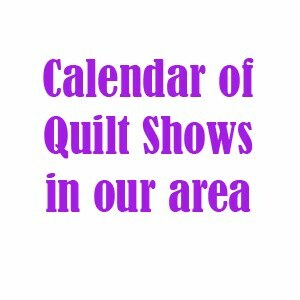 Please contact Michelle if you're interested. 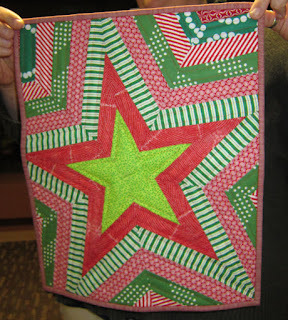 December Meeting: The December meeting will be our annual holiday party. 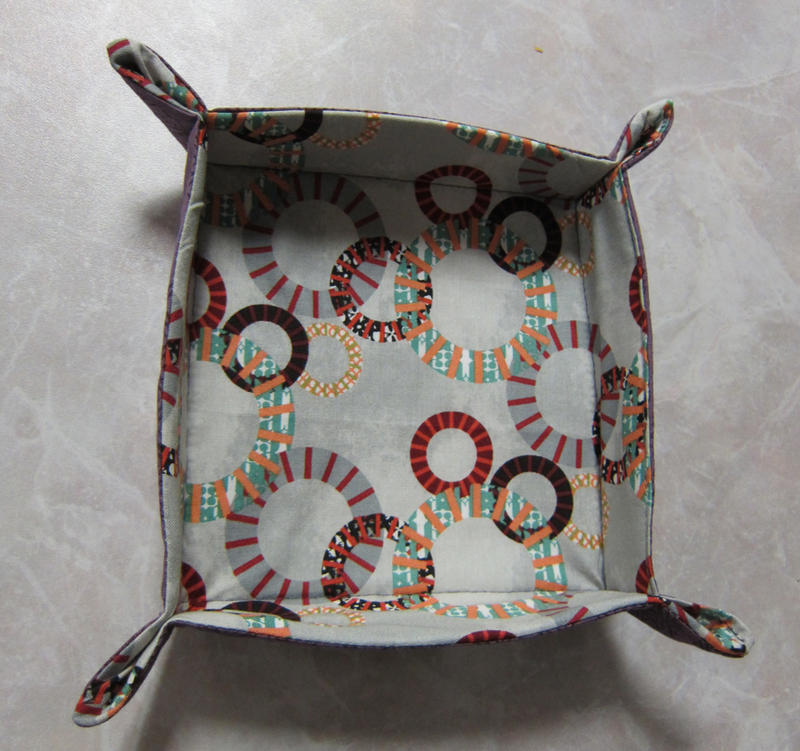 Please bring a dish to pass and your swap item (if you signed up at the November meeting). We will have show-and-tell so be sure to bring your latest work, too. 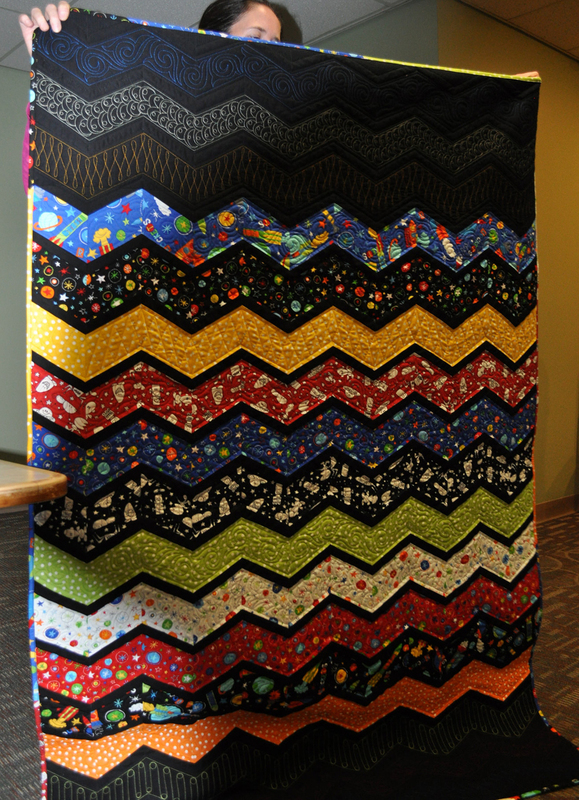 QuiltCon Charity Quilt: Thanks to the hard work of Ellen, Teresa, Gillian, Annie, Abby, and Dorothy the CMQG QuiltCon charity challenge quilt top and back are complete! 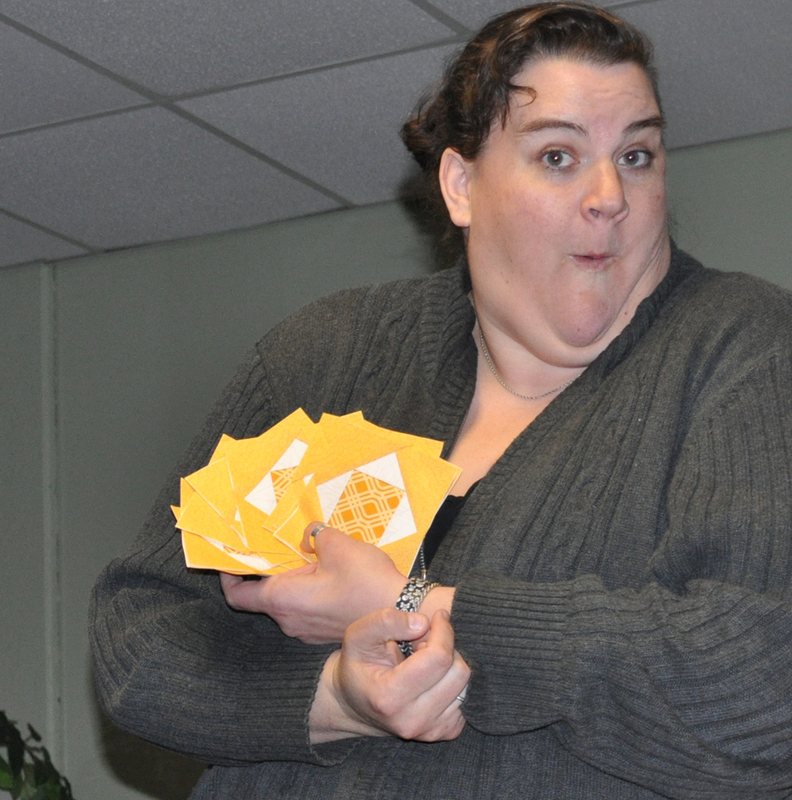 The theme of the challenge was improv with intent. 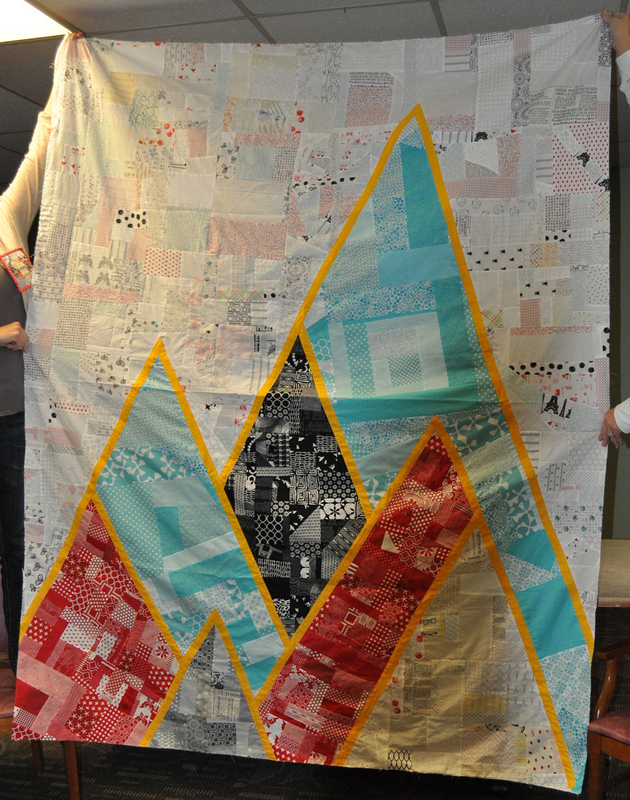 Our members improv pieced the colored sections and then appliqued the seven hills (of Cincinnati) over the white background. 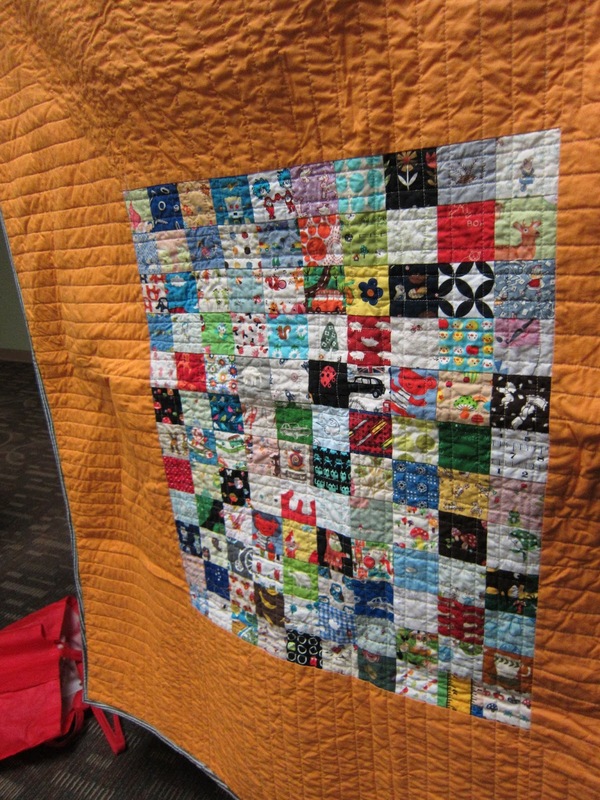 The colors they used were selected by the QuiltCon challenge team. 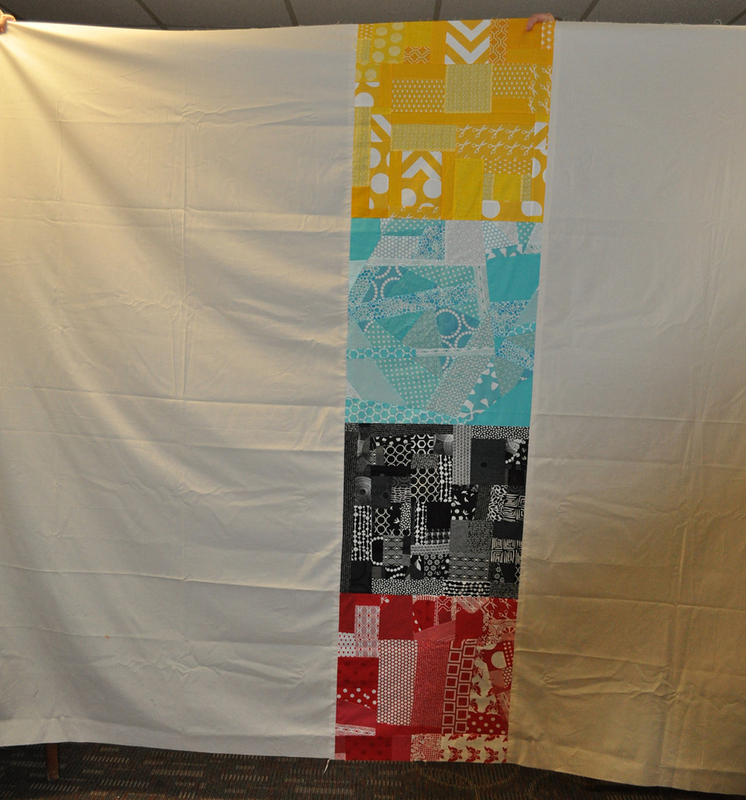 A huge thank you to our members who worked on this quilt! It's awesome! 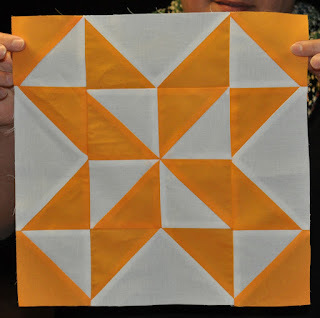 Sarah will be doing the quilting. 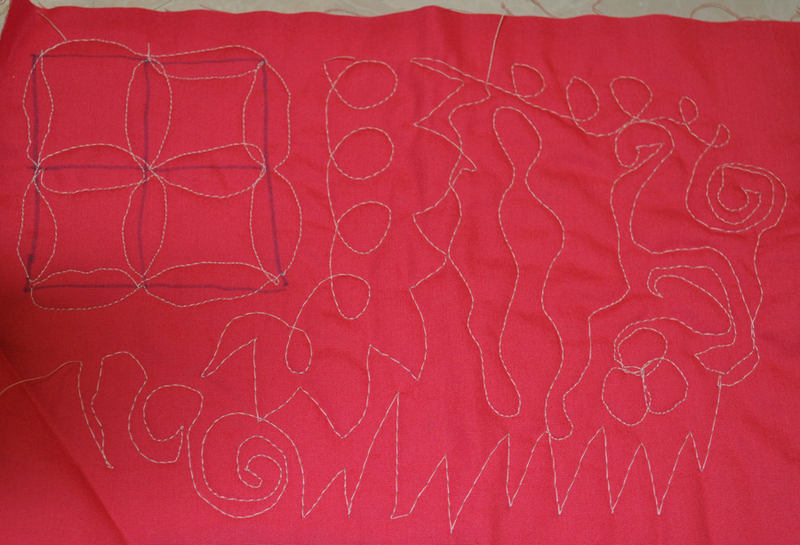 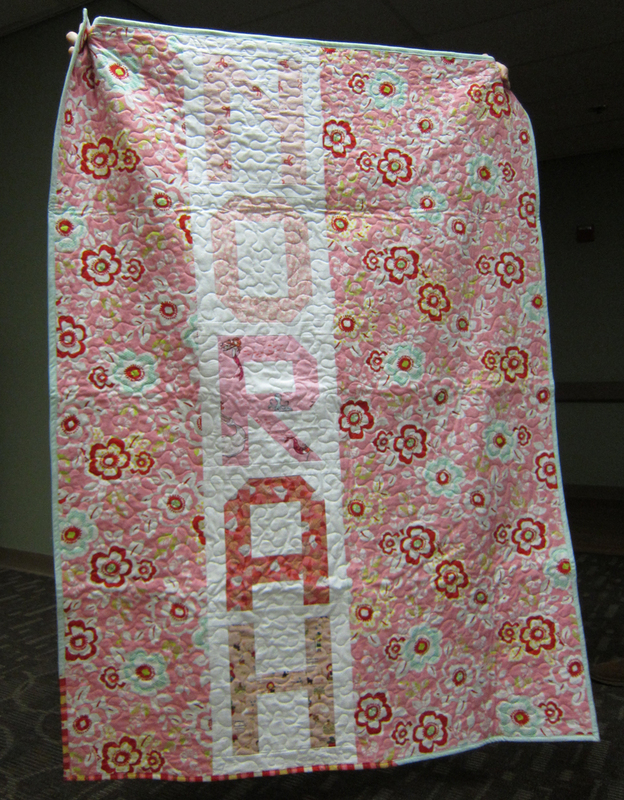 The quilt is due to QuiltCon in February 2016. 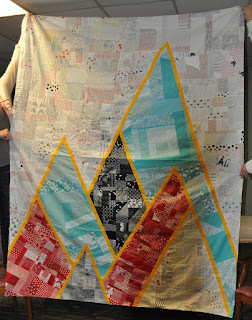 QuiltCon charity challenge quilt top with the seven hills of Cincinnati. 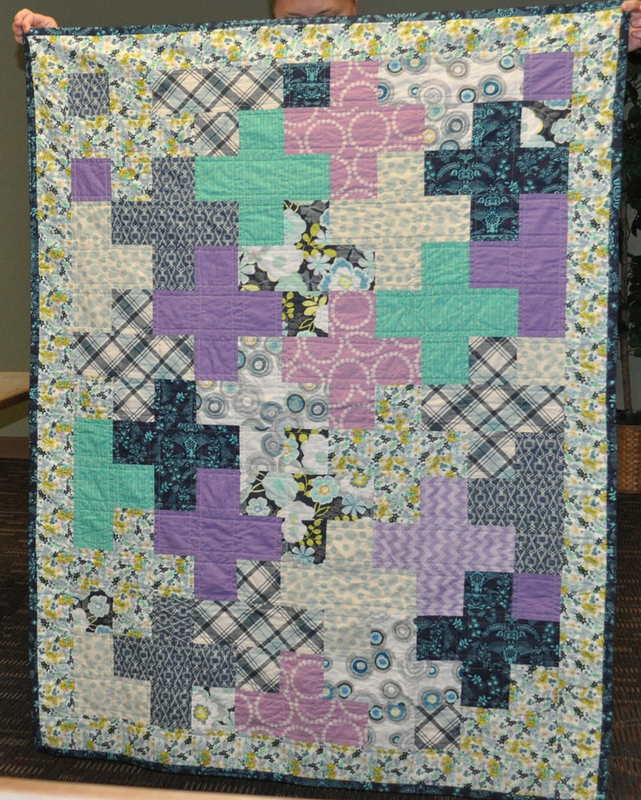 The charity challenge quilt back with section of improv pieced fabric. 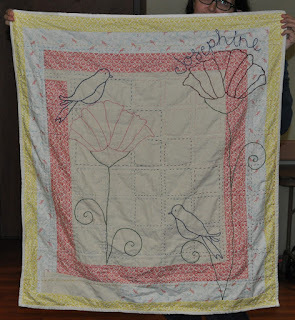 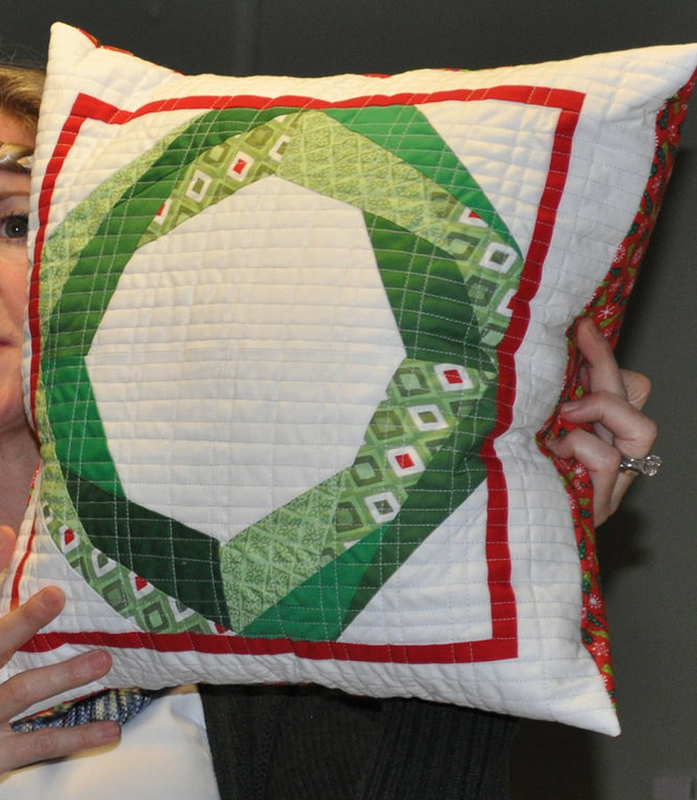 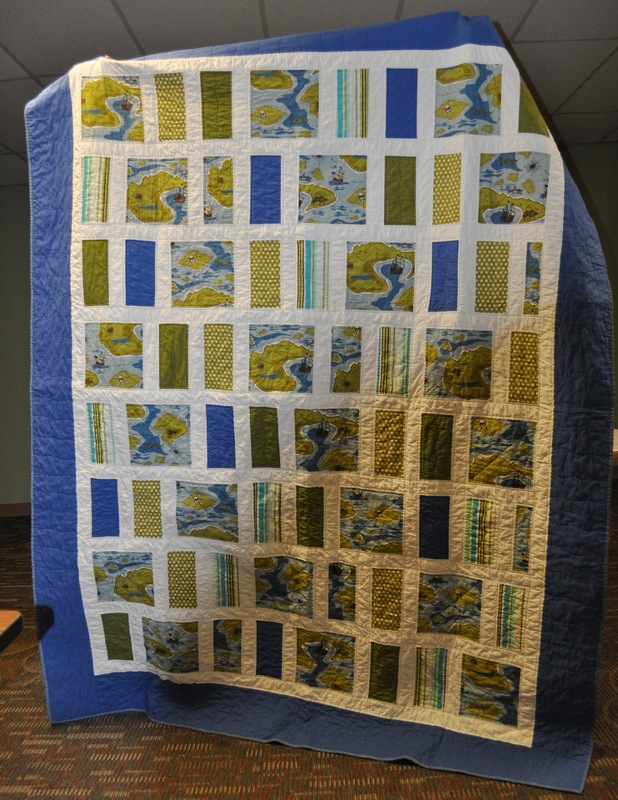 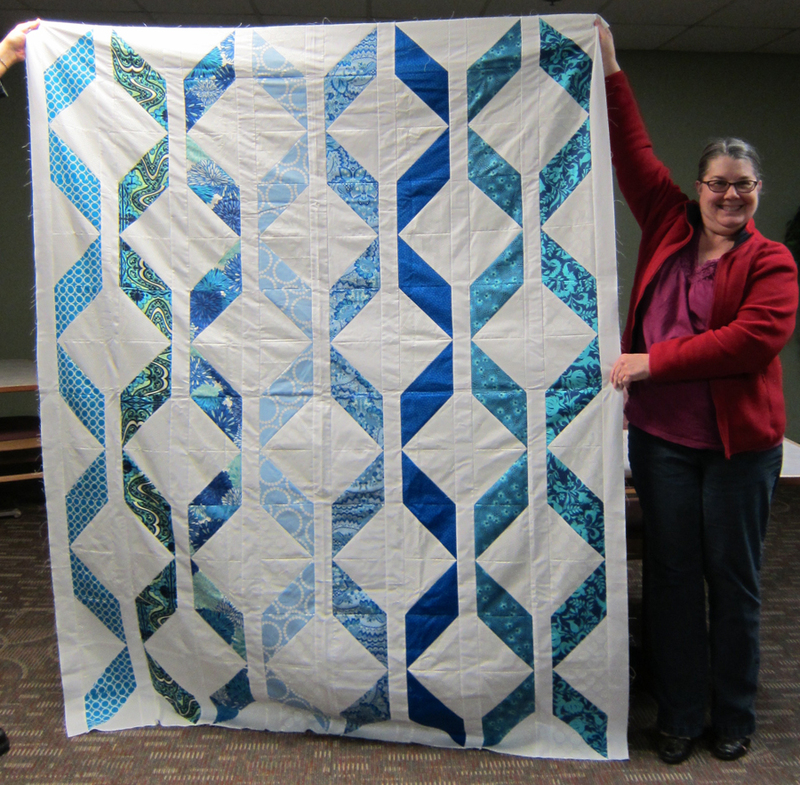 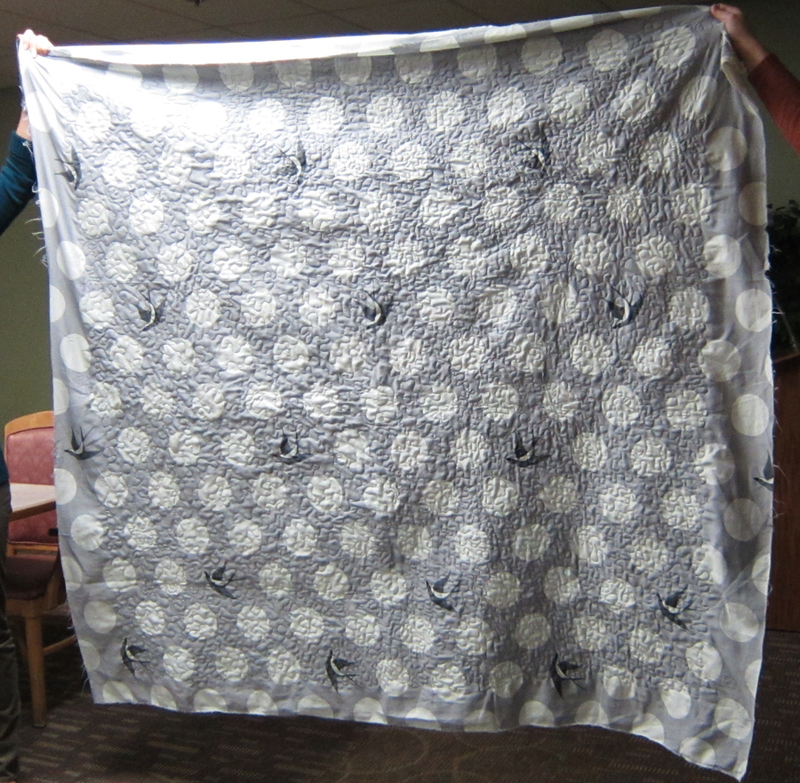 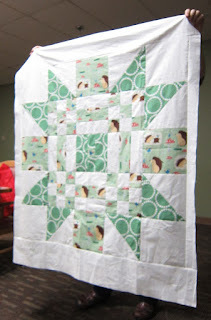 At the October meeting, Holly gave a presentation on free-motion quilting. Members practiced the techniques and brought in their work to share at this month's meeting. 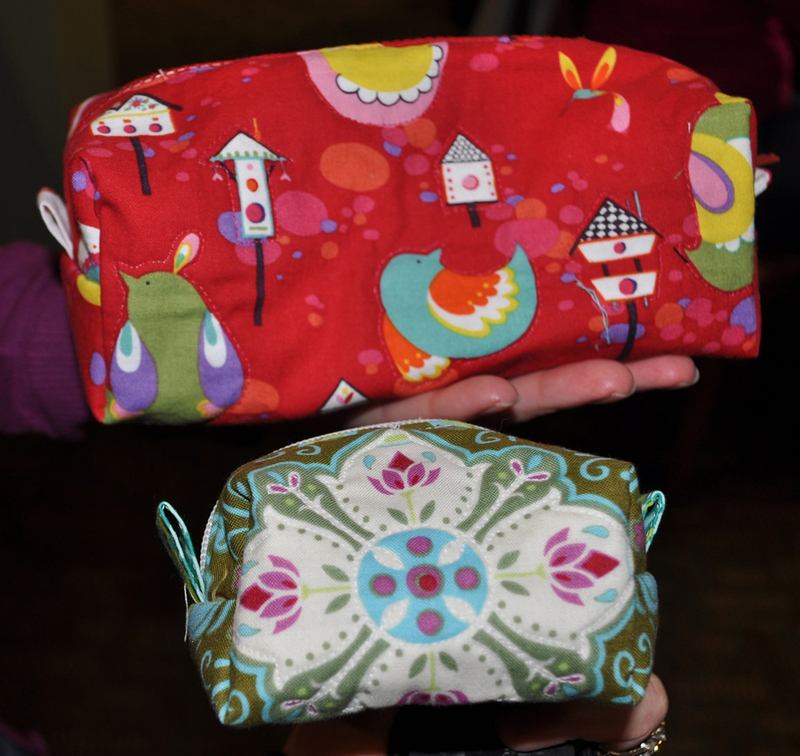 Janice practiced by quilting around the motifs on these pouches. The members participating in the Round Robin/ Traveling Quilt swap brought their blocks to show. 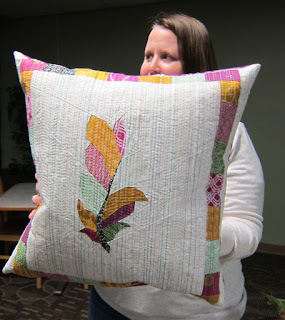 Abby started making these flying geese for Kara's quilt. Annie made these blocks for Shonna. Brooke make these blocks for Kara's quilt. 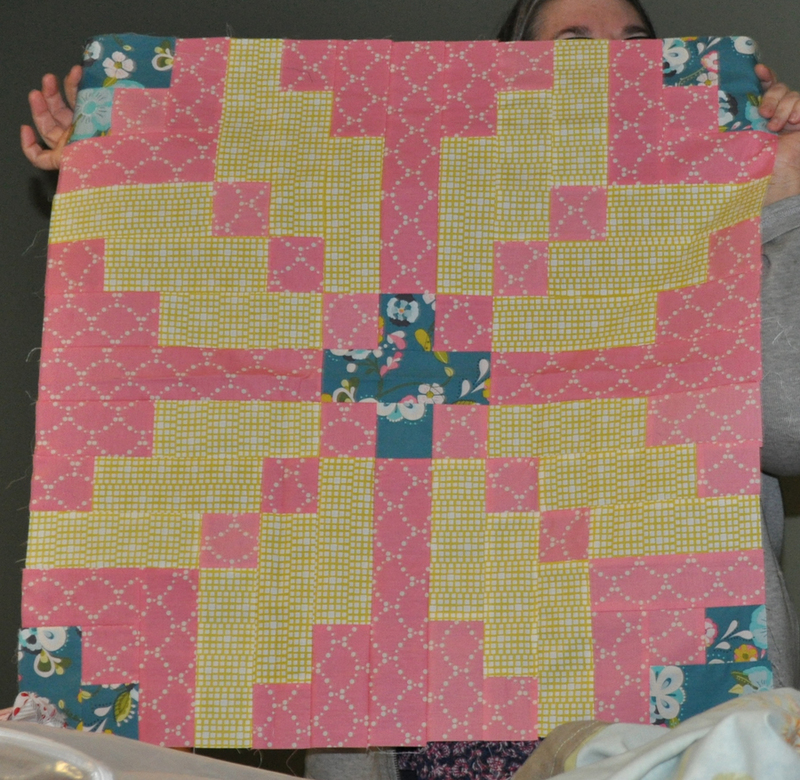 And Brooke make some blocks for Kathy. 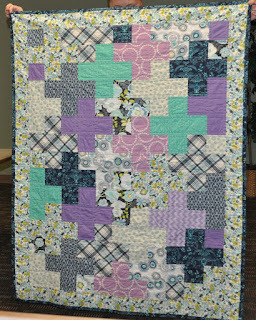 Ellen2 made this block for Brooke. 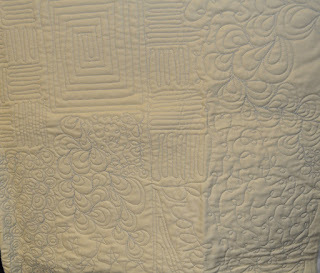 Ellen make two blocks for Annie's quilt. 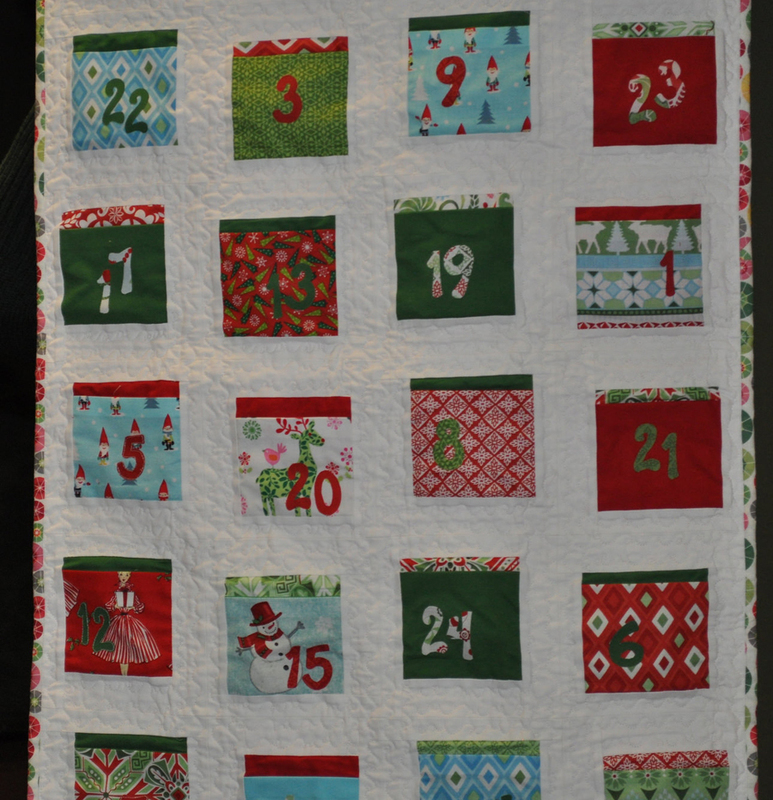 Another block from Ellen2 to Brooke. 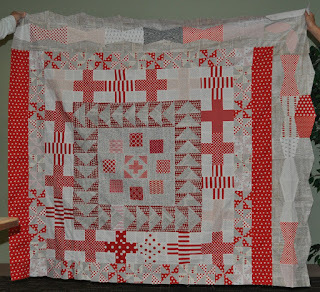 Janine added the tumbler blocks to Ellen's quilt. Kathy made two blocks for Ellen2's quilt. 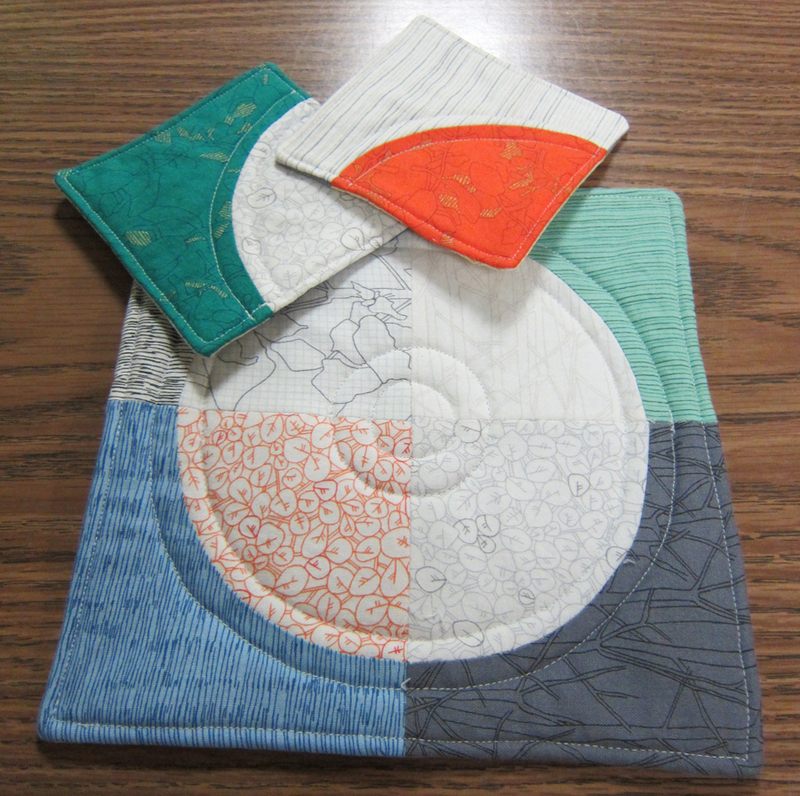 Robin made this block for Janine's winter-themed quilt. 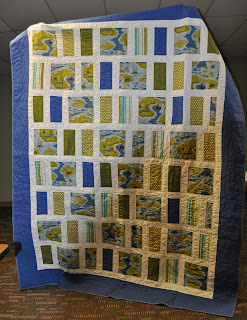 Shonna made two blocks for Carrie's nature-themed quilt. 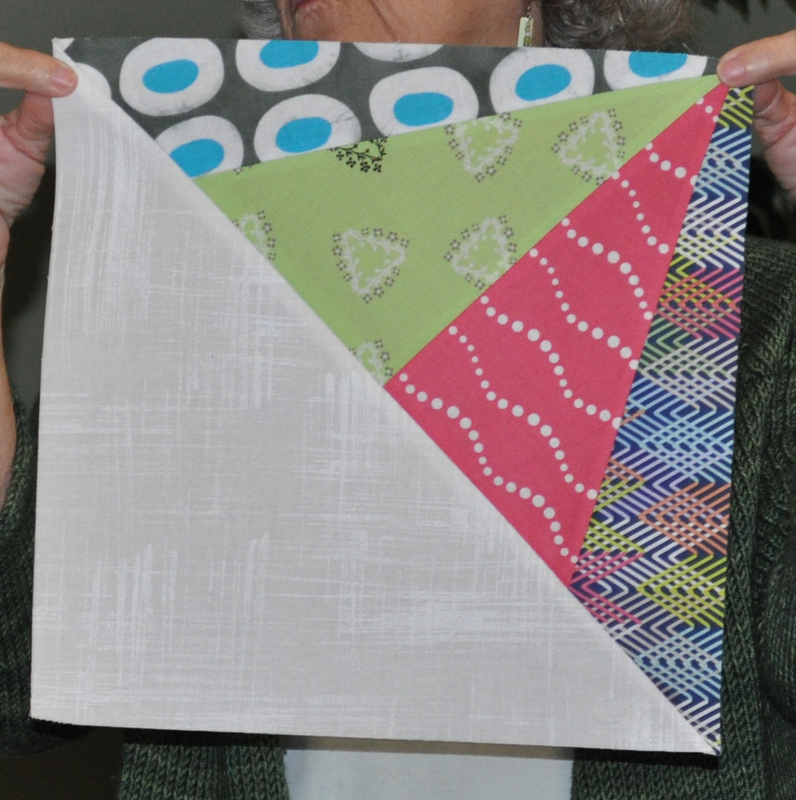 Wendy made two blocks for Robin's quilt. 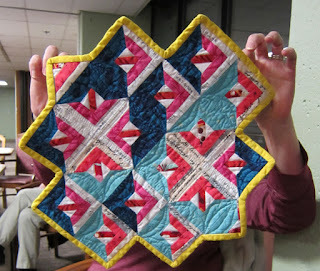 Annie made this quilt from scraps. 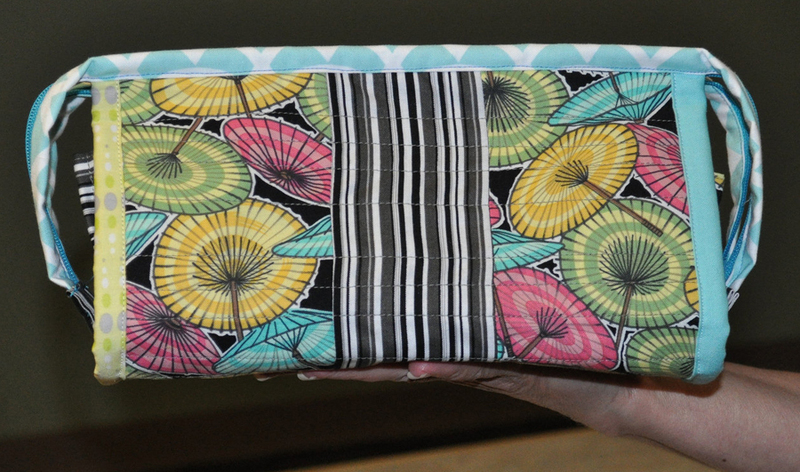 Brooke made this laptop case for her aunt. 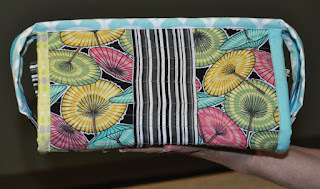 Brooke used flannel on the inside of the case. 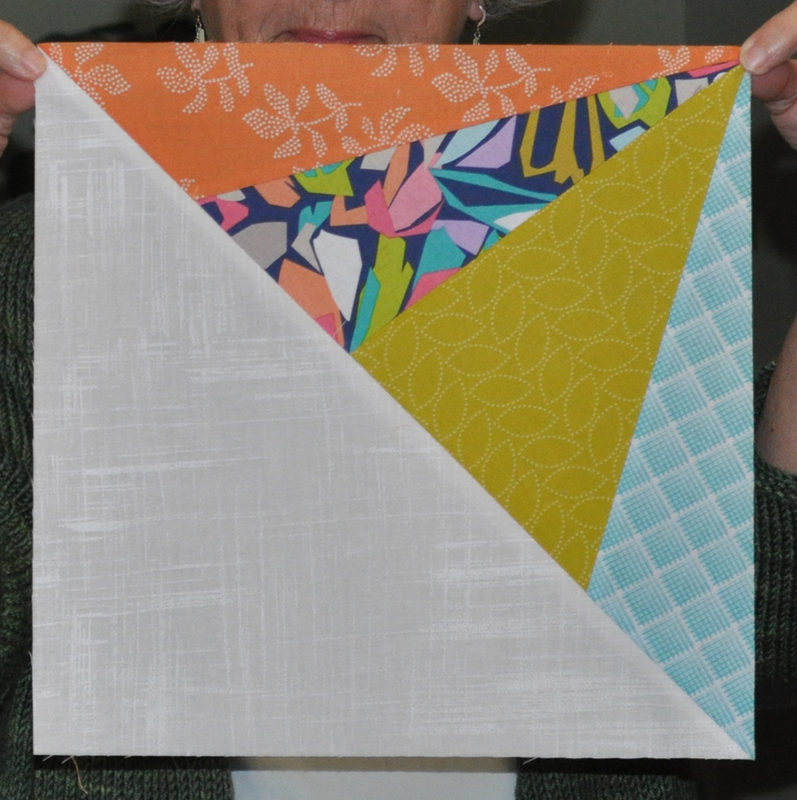 Brooke also made this block from a new quilt pattern by Elizabeth Hartman. 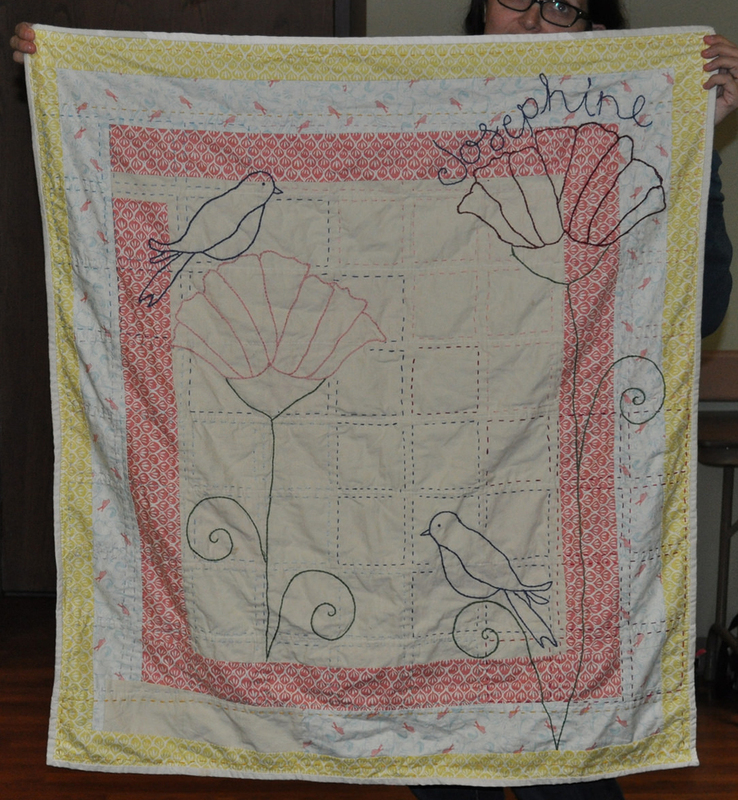 Christine finished this quilt to be donated to the Children's Home of Northern Kentucky. 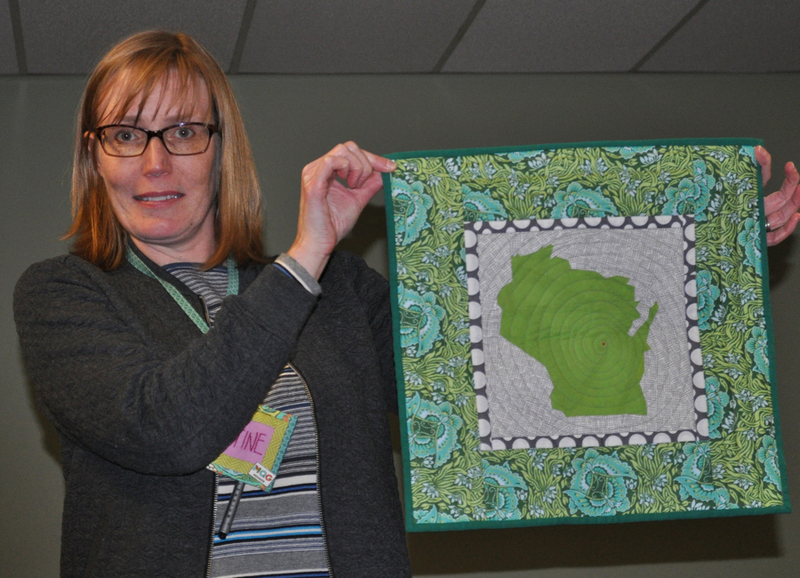 Christine also made this wall hanging of her home state using a pattern from Craftsy. 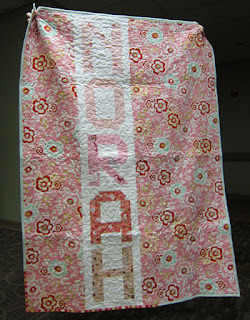 Dana made this car quilt which includes some hand embroidery. 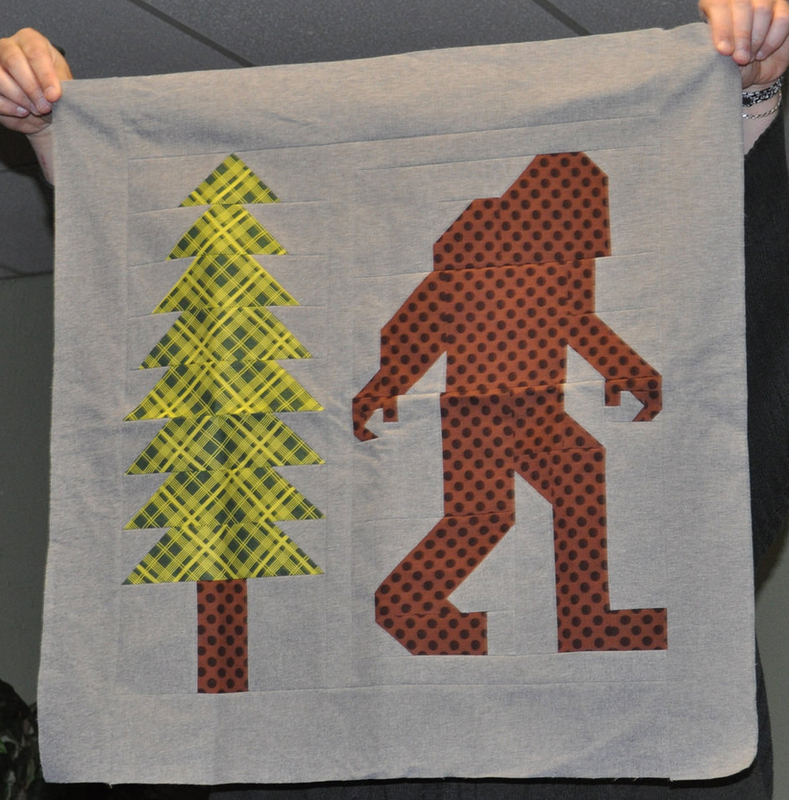 The back of Dana's quilt. Holly started this quilt when her oldest was a baby. 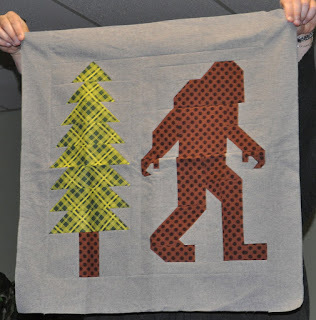 She added to the length to make it bigger now that he's older. 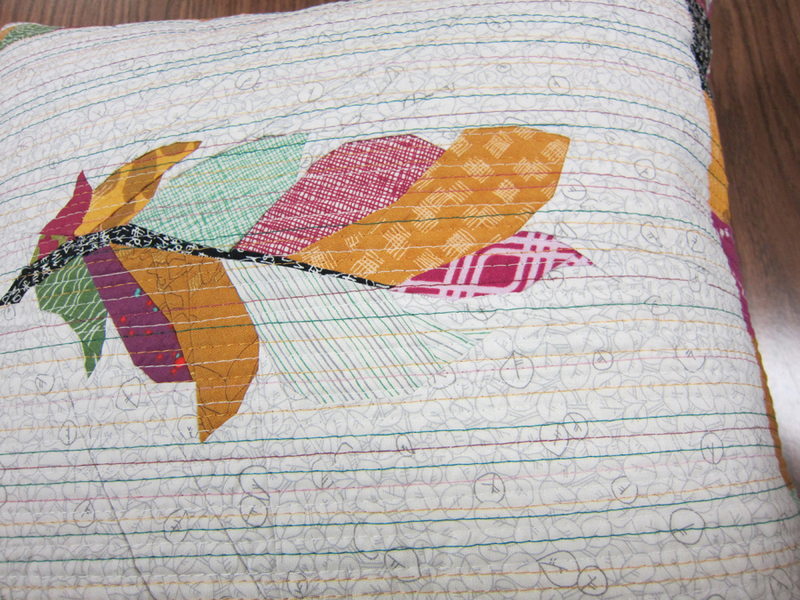 The backing fabric is minky. 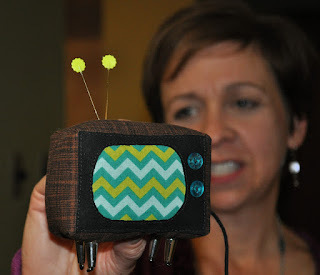 Janice made this cool television pin cushion. Janine was inspired to make the Sew Together Bag after the OHCraft retreat. The inside of Janine's bag. 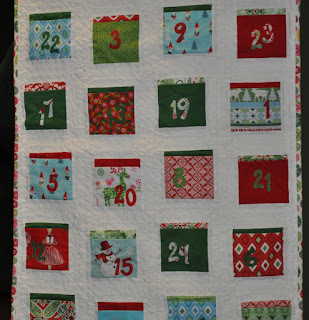 Michelle made advent calendars for her daughters. Michelle also brought this holiday pillow to share. Michelle made this block from a kit from Sewn Studio.